The $30 million (USD) project was designed as an agent for economic development, and has become a case study for creative solutions to a spectrum of challenges facing historic cities, including ecological rehabilitation. The park functions as a ‘green lung’ because of its enormous potential, being located at the center of a historic location. It was clear that Cairo needed more green space. One study found that the amount of green space per inhabitant was roughly equivalent to the size of a footprint, one of the lowest proportions in the world.The park is the largest green space created in Cairo in over a century, reversing a trend in which unchecked development has virtually eradicated the city's once famous parks. Located on the western side of the park are the old Fatimid city and its extension Darb Al Ahmar, with their wealth of mosques, madrasas and mausolea, signaled by a long line of minarets. 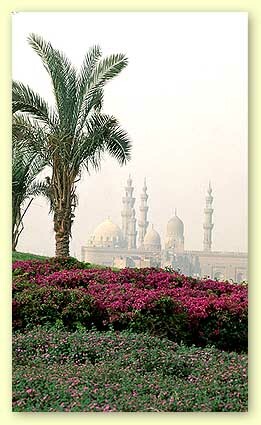 To the south are the Sultan Hassan Mosque and its surroundings, as well as the Ayyubid Citadel. On the eastern side is the City of the Dead with its many social welfare complexes sponsored by the Mamluk Sultans and dignitaries, which became an area that developed into a dense neighborhood of its own. This area was indeed in great need of an open green space. The hilly topography of the site, formed by debris accumulated over centuries, now provides elevated view points dominating the city and offers a spectacular 360° panorama over the townscape of historic Cairo. Before work started, Al Darassa was a municipal rubbish dump. The builders had to clear a 500-year-old accumulation of fill and debris, the equivalent of more than 80,000 truckloads of material which built up here over the centuries. While the sit was being prepared major discoveries were made. 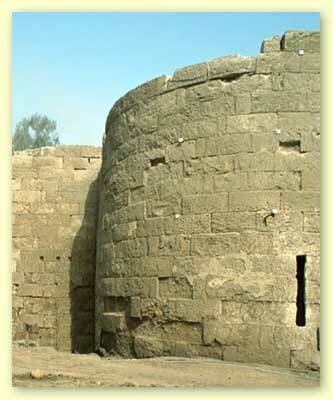 These included the discovery of the 12th century Ayyubid city wall of Cairo that was built during the reign of Salah el-Din, as well as some valuable stones with hieroglyphic texts. These more ancient blocks, some measuring as much as one meter long, were used in the building of Salah el-Din's wall. To extricate the 12th century Ayyubid wall, which had been buried up to its crenellated battlements, it proved necessary to excavate to a depth of 15 meters. A 1.5-kilometre section of the historic wall, with several towers and battlements almost intact, then appeared in all its splendor. The importance of the wall with its gates, towers, interior chambers and galleries linking the park to the adjacent Darb al Ahmar district led Aga Khan to launch a combined physical and social rehabilitation of the Darb Al Ahmar district. It was clear that the park construction, as well as the historic wall conservation could, and should, act as stimuli for the rehabilitation of Darb al Ahmar. The multidisciplinary project presented a range of complex technical issues, including highly saline soils which first required the creation of specialist nurseries to identify and grow the best plants and trees for the soil, terrain and climate. Over two million plants and trees were propagated, of which over 655,000 have now been planted in the park. This also required the incorporation within the park of three large fresh water reservoirs for the city of Cairo, each 80 meters in diameter and 14 meters deep. 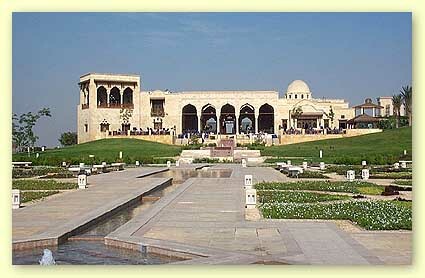 The Park’s conceptual design was developed by the consultant, Sites International, Cairo, who sought to make maximum and skillful use of the site location, elevated topography, and unique vistas overlooking Historic Cairo. 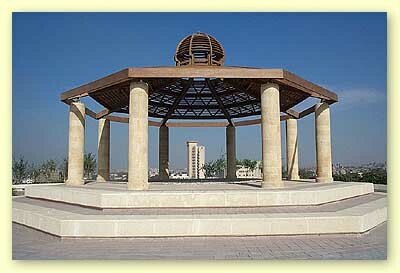 The Al Azhar Park features shaded walkways, a children’s play area, a museum and a stunning hilltop restaurant and lakeside cafe. The Hilltop Restaurant, designed by Rami el-Dahan and Soheir Farid, was inspired by traditional Cairene architecture. 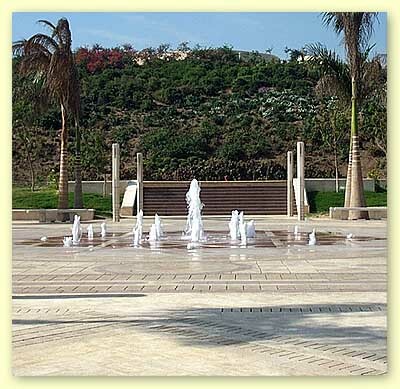 It is designed around a courtyard with a small traditional fountain at its center. A graceful shaded area leads to a terrace, which has a magnificent panoramic view of the Citadel, and then down towards a formal garden. Here the marble columns are real, and much of the stonework was done by hand. There is also the Lakeside Cafe, which is breathtaking. Designed by Serge Santelli, the cluster of white pavilions floating on a lake breathes new life into traditional Islamic architecture and exudes an exhilarating feeling of lightness, joy and serenity. 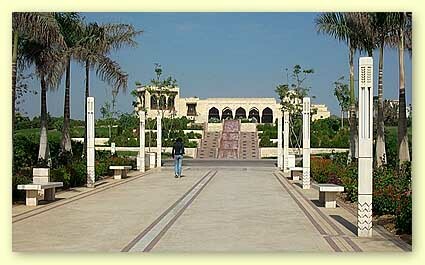 With its wooden screens and surrounding citrus groves, at places it extends into the park itself. The cuisine at Lakeside is mainly Lebanese. The generously dimensioned pedestrian paths follow the contours in most areas, allowing for comfortable circuits throughout the entire Park site. An important exception to the curvilinear path system occurs along the main promenade, off the eastern entry gate. 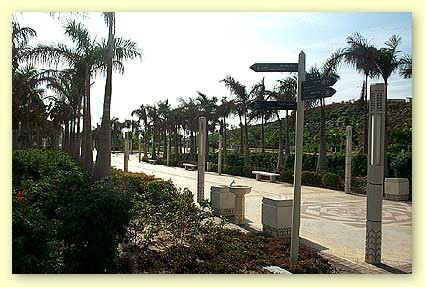 Here a formal and linear promenade runs along a straight but descending course from the Hilltop restaurant through the center of the central water-tank top, and continues 250 meters southward on axis with the Citadel complex to the south. This processional path measures eight meters wide and is to be flanked on both sides by two rows of royal palms and parallel side paths, with lateral niches for seating. At a star shaped area at the southern extreme of this path, the main promenade turns in a southwestern direction, passing through a compartmentalized, formal garden and then to the Lakeside pavilion-cafe. The outer zones of the plain feature an orchard (bustan) which will provide shade, a stimulating variety of flowering and fruit trees, and further room to stroll. The main promenade and series of formal gardens are anchored at each end by the hilltop restaurant and lakeside pavilion, which provide internal landmarks for the Park. Water features provide an additional and traditional theme from Islamic gardens, tying this central pathway together along its entire length. Water fountains, pools, and carefully confined water channels are dispersed and lead, ultimately, to the freer form of the lake in the south meadow. A continuous pathway has been carved into the hillside at approximately mid-height between the walkway along the Historic Wall and the summits of the hills, providing lateral access at points to the eastern half. The western hillside will be covered with flowering and succulent plants with luxuriant tones. Views from the many vantage points along the west, across these slopes and the restored Historic Wall to Old Cairo, beyond, with its beguiling constellation of major monuments with their domes and minarets, will be captivating for residents and visitors to Cairo alike. 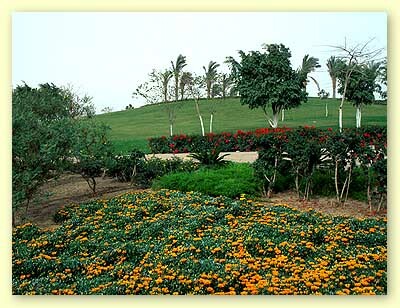 The Park vegetation vary from dry, succulent plants on the western slopes to lush, grassy meadows with shade trees, to formal gardens and, finally, to bustan-like orchard spaces. The variety of species, particularly native Egyptian plants, will aim at establishing a new benchmark for park spaces in the region. The Trust has initiated a range of community-based urban upgrading projects that contribute to the improvement of living conditions around the park by providing the local people with cultural, social, economic, and institutional support. These included the restoration of the Umm Sultan Shaban Mosque, the Khayrbak Complex as well as the rehabilitation of the Darb Shoughlan School currently being used as a combination community and visitor’s center. As well as the Micro-credit loans that has enabled residents to open small businesses to support themselves. The construction of the park and the restoration of cultural monuments are meant to be catalysts for social and economic development and the overall improvement of the quality of life in the district. At the same time, the park offers a new vantage point with spectacular views of Historic Cairo’s countless architectural treasures, which will no doubt draw foreign tourists and the inhabitants of greater Cairo alike to the once-neglected area. 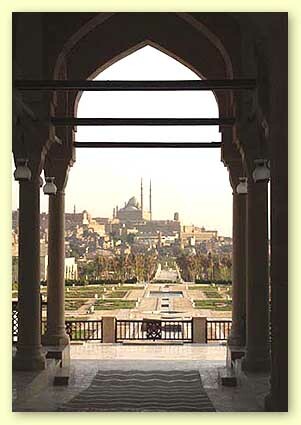 “It is my wish that the new Azhar Park with its central location will become a major new resource for visitors and residents of Cairo, opening up new views onto the surrounding historic monuments of a unique area of a unique city,” said the Aga Khan.